Wednesday's 2% decline in EURUSD was the only 3rd of such magnitude over the past 3 years. There have been five of + or 2% in the last 3 years, 2 of which occurred last month; (-2% Oct 31 after referendum announcement and +2% on Oct 27 after the EFSF/Troika/recap deal). Yesterdays 13% surge in EURUSD 1-month volatility typified the broadening rise in the currency's volatility as of late. 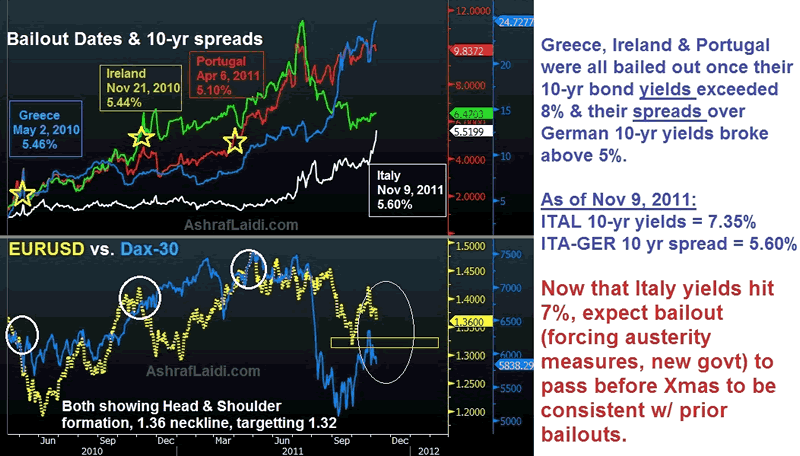 Greece was bailed out on May 2nd, 2010 with an 8.5% yield and 546 bps over German spreads. Ireland's bail-out followed on November 2010 with an 8.09% yield and 544-bp spread. Portugal's bailout occurred at 8.54% bps and 510-bp spread. Italy's 10-year spread currently at 5.58% fits the schedule of the timing of prior bailout (or for austerity to be passed). With Italys new coalition govt. unlikely to be formed until around the Christmas break, counting 40-50 days from today's 7% breach, matches the 55 days it took for Portugal to obtain its bailout after the 7% hit. As Eurozone banks rush into raising USD funding to alleviate the unfolding liquidity crunch, the cost of USD funding has risen further, thereby helping to stabilize USD. The cost of USD funding as measured by USD 3-month LIBOR surged 80% from the summer lows, reaching 0.4497%--at the highest level since June 2010. As Eurozone 3-month LIBOR fell to 5-month lows at 1.4270%, the spread of Eurozone 3-month LIBOR over its USD counterpart fell to 0.977, the lowest in 7 months. We mentioned the EU-US LIBOR spread in our September 21 piece when it stood at 1.31%. Now that the ECB is in full easing stance, the effect of its stepped up Securities Markets Programme (SMP) could be a net negative on the single currency. In other words, when ECB LIBOR is falling partly due to anticipated easing (instead of improved liquidity conditions), the FX impact tends to be negative. The ECB bought EUR 183 billion in PIIGS bonds since May 2010. Once the ECB reaches (and will be forced to reach) about EUR 300-400 bln in purchases, it will remain doubtful whether it could continue to sterilize (later withdraw) these purchases. Once it no longer withdraws these injections, we would expect the currency impact to be negative (as was the case with outright QE from the Fed). 6 weeks after we made the case for a German economic contraction here, the numbers appear to be heading that way. Even the ECB is uncharacteristically admitting a mild recession in the Eurozone. Germany's Ifo business climate and ZEW investor surveys all point to a deepening slowdown, while the manufacturing and services PMI are also showing the same patterns as in the 2007 recession. As Germany's economic dynamics worsen, they will further force the ECB into more activist easing, with an emphasis on boosting growth, while relegating inflation priorities to statistical records as all other major central banks have started to do. Technically, we stick with our revised forecast of $1.32 by end-month, while the $1.27 call is now being pushed into mid Q1 2012. Most striking about the euros 8.5% rebound in October 4-27th, is that half of those gains were lost in the ensuing 3 days. Three days. Get your free 1-week trial to our Premium Intermarket Insights on FX, commodities & equity indices. Ashraf Laidi CEO of Intermarket Strategy and is the author of "Currency Trading and Intermarket Analysis: How to Profit from the Shifting Currents in Global Markets" Wiley Trading. This publication is intended to be used for information purposes only and does not constitute investment advice.